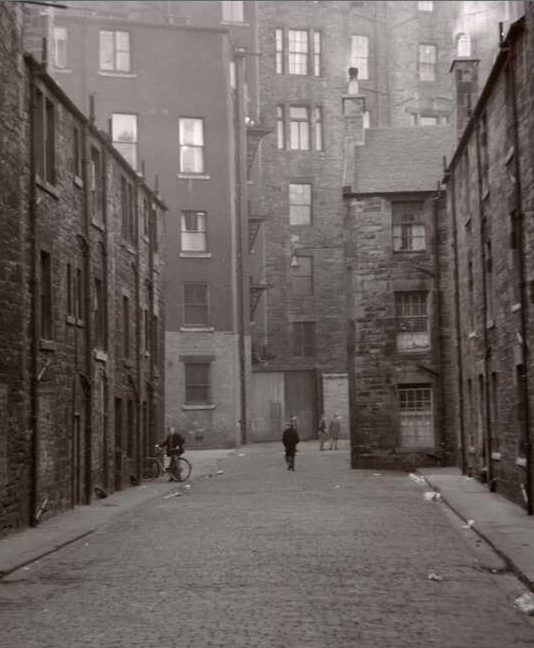 For us who live in Edinburgh and who are old enough we can remember the slum buildings which were located at the top end of Leith Street and just down from Princes Street, and this area was called Greenside. The would-be traveller to Leith may nowadays be daunted by the unpromising and hazardous start to their journey. 24 Greenside Place is situated just beside the Tabernacle. This was Emilio Quilietti's home. The grimness of Leith started even before the grandeur of Register House was out of sight. 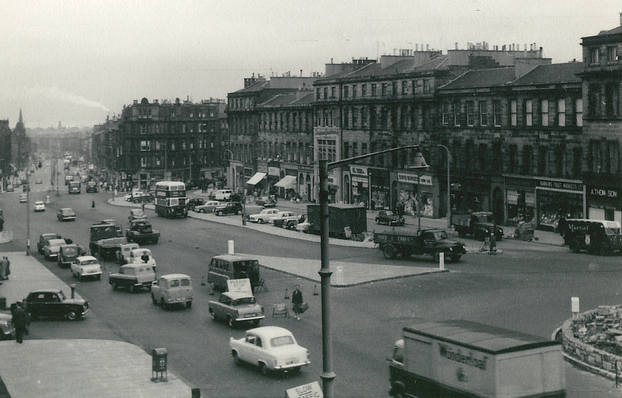 Leith Walk is a long street which traditionally starts right off Princes Street and down to the Foot of the Walk, a very long mile. 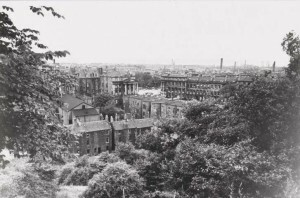 Greenside lies on the north-west side of Calton Hill. Here lay the populous surburb of Greenside which was built on grounds which belonged to the ‘Carmelities’ or ‘White Friars’, anciently the site of a Chapel dedicated to the Holy Cross. Near the chapel lay a cross called The Rood of Greenside where it is documented that in 1534 two locals called David Stratoun and Norman Gourley were burned as heretics. Calton Hill stood behind some 350 feet above sea level and from here the Friars could guard their area with the magnificant views down to the Forth and beyond. 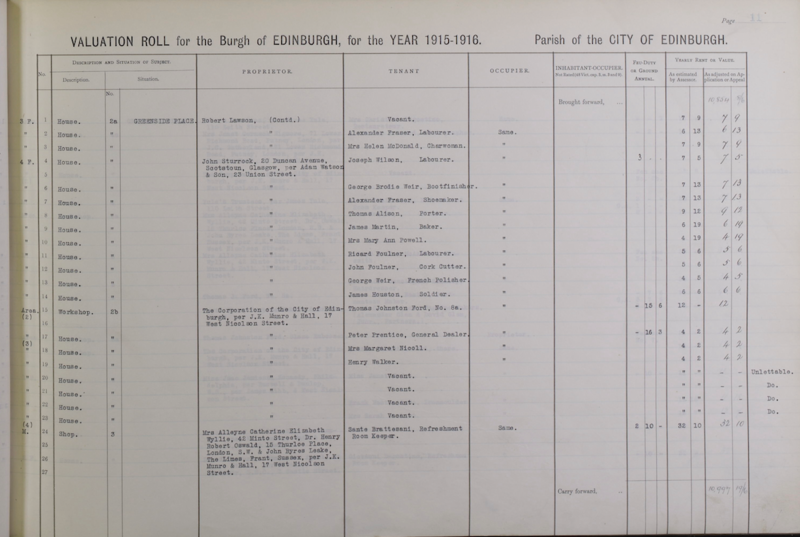 The population of the City of Edinburgh during the nineteenth century had increased faster than ever before helped by the Highland Clearances, the Potato Famine which not only affected Ireland but also the Scots and also the emigrants which were now starting to appear from Italy, where there Unification caused unseen problems. In two generations during the middle of the nineteenth century the population had more than doubled. 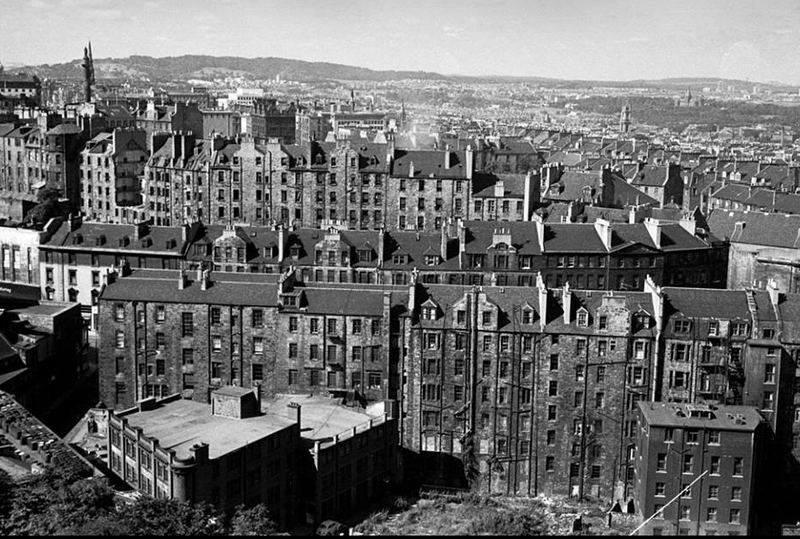 As soon as the great tenements emptied they were filled up again with twice as many occupants in one room. 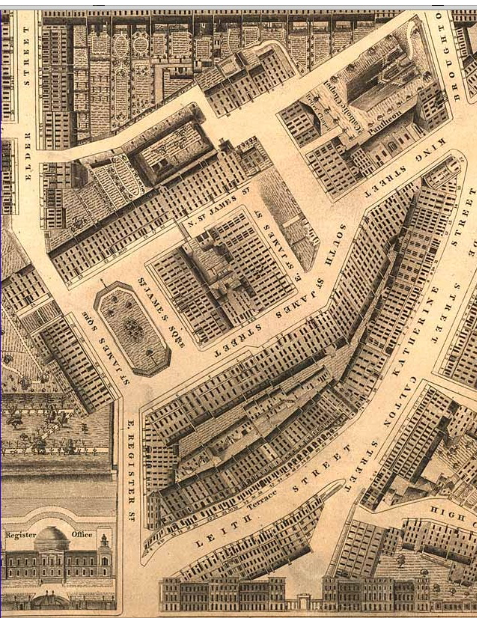 Leith’s long history had now abandoned their war wounded and instead of the proud soldiers and sailors marching up from the docks the street was a haven for the injured soldiers and sailors who took to begging to keep themselves alive. ”] The public transport system sort of took off at this time as well. There was at first horse drawn buses followed by horse-trams in 1870. Cable cars followed in 1899 and electric cable cars in 1910. From the 1870s Greenside is steeped in Quilietti and Brattisani family history as is St. Mary’s Cathedral just opposite. 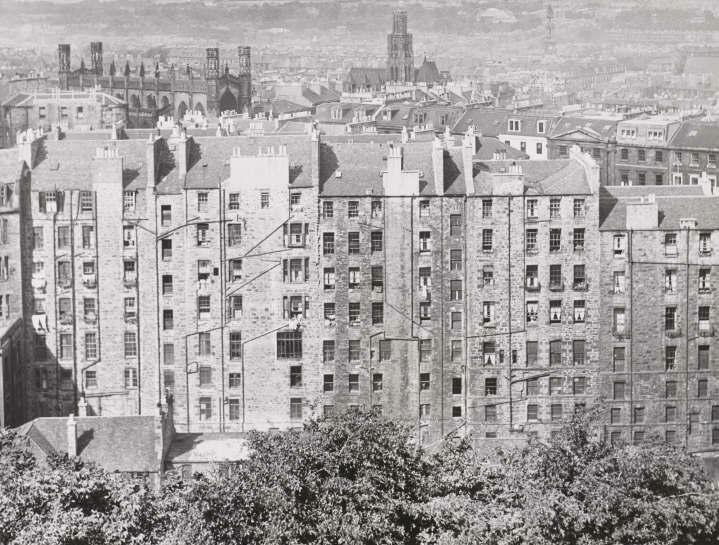 Demolition work started in the Greenside area in April of 1961 by which time our families had all moved out to better housing in the new ‘schemes’ at the outskirts of Edinburgh. 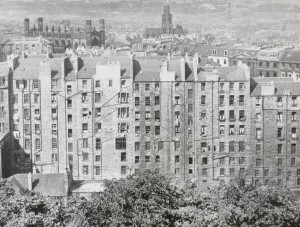 The Greenside flats were nine stories high if you counted the two basement flats which were apparent from the back. Today there is only one block at the back in Marshall’s Court, and this building was build circa 1933 and was not part of the old grim tenements. 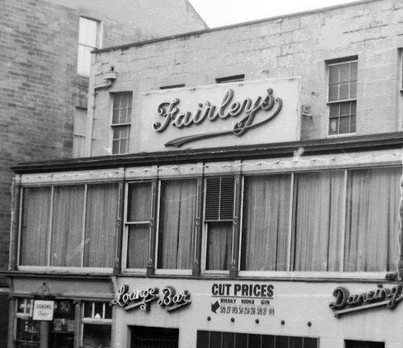 Fairleys of Leith Street which was the local dance hall. It was a favourite with servicement both during and after the Second World War. Of course everyone who is of an age remembers with great fondness JEROMES the photographers. On Calton Hill on Greenside Row there was a tunnel cellar called THE MIDDEN DOOR where the scavvy kept his barrow and broom. This was one of the meeting places where the locals would sit and have a chat. Then of course there was the Salon Picture House in Greenside Place where they would famously show all the B rated movies. This was a cheap form of entertainment and the picture house was always full and always full of fleas. At the back of the Salon stood the Pensioner’s Hall which was affectionately called The Dump. Locals gathered here and there were local bands who would play. The Omonds from Greenside were one such band which played on a Saturday night. Next to St. Mary’s stood the Theatre Royal. On Saturdays the Actors and Actresses would attend the theatre for rehearsals and this would cause a great fuss with the local children. Also on Saturdays a ‘Mission’ Band would play at the bottom of Little King Street. All the children joined in the hymns. If they all sung loud enough they got a penny at the end of the meetings. 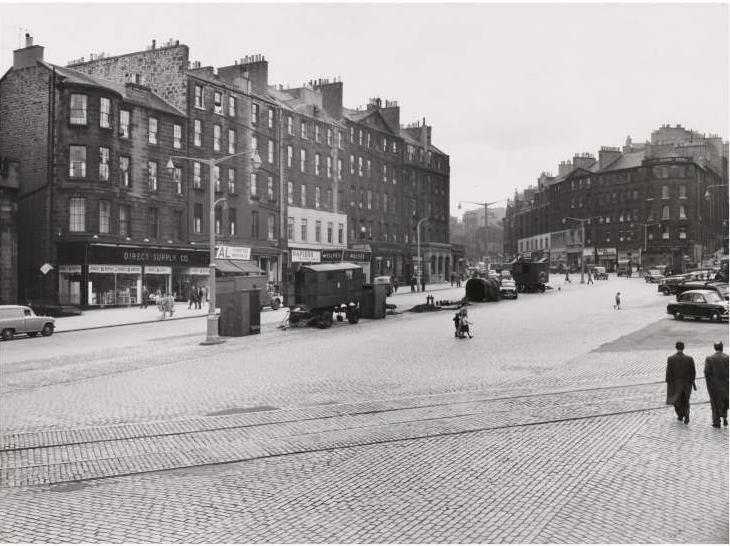 On Leith Street and Greenside Place there were lots of shops. Jackson’s the Taylors, Littlejohn’s the Bakers and Anneker’s the cold meat shop. 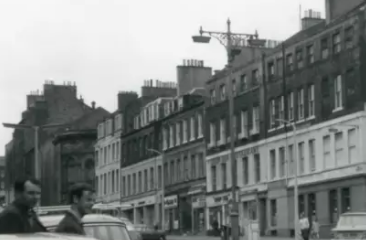 There were not one, but two Duncan’s sweets’s shops in this part of Leith Street. There was even a wee museum called the Creepy Waxworks Museum. Down in Greenside there was a Cigarette Factory and the girls who worked there came into Barnetts for stockings which cost a shilling a pair. 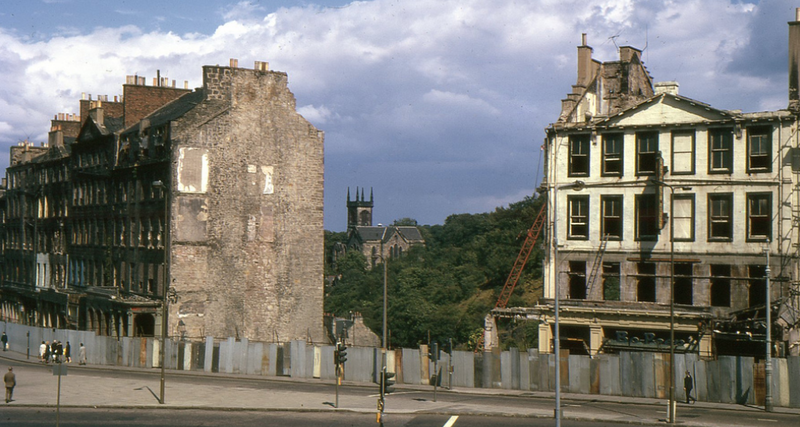 “Calton Hill became very much ‘off-limits’ in 1953, following the murder of two small girls in the Greenside area at the back of the Playhouse cinema. “Our first mode of transport was the forerunner to the formula 1 racing car, the ‘Guider’. It was a self-built vehicle, built from anything we could get hold of and propelled by kneeling on it and shoving it along from behind with one of your feet. The prototypes were made of a few planks of wood, a cross-member whittled down, a piece of string which was our steering and four ball bearings for wheels. Where we stole the ball bearings from I cant remember, but they did the job. The onlyproblem was that you could hear us speeding down Elm Row from a mile off! We then progressed and modernized our “Guider”, by stealing prams and removing the wheels – similar to today’s trend, but today its with cars. Times haven’t changed so much after all, have they? For both the Quilietti family and the Brattisani family Nos. 24 and No. 9 Greenside Place were our families homes for many years. Then St. James Place opposite, just where John Lewis goes up the Hill today is where Emilio’s sons and their families started off. No. 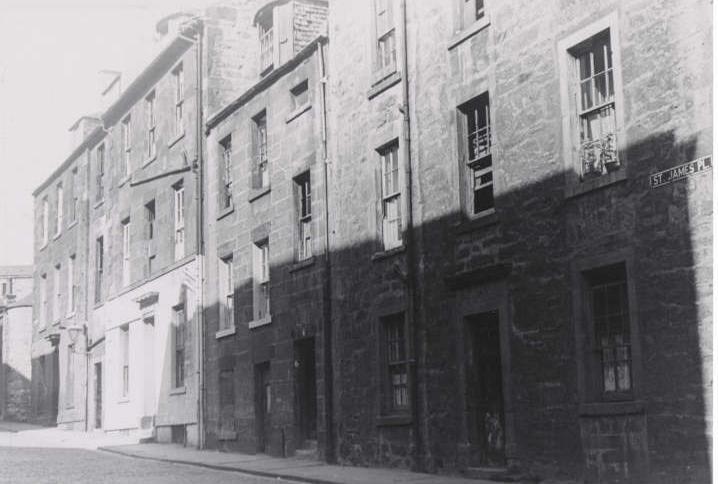 9 Greenside Place in the 1960s had Napiers Sho Repair Shop as one of the shops on the street level of the tenement. 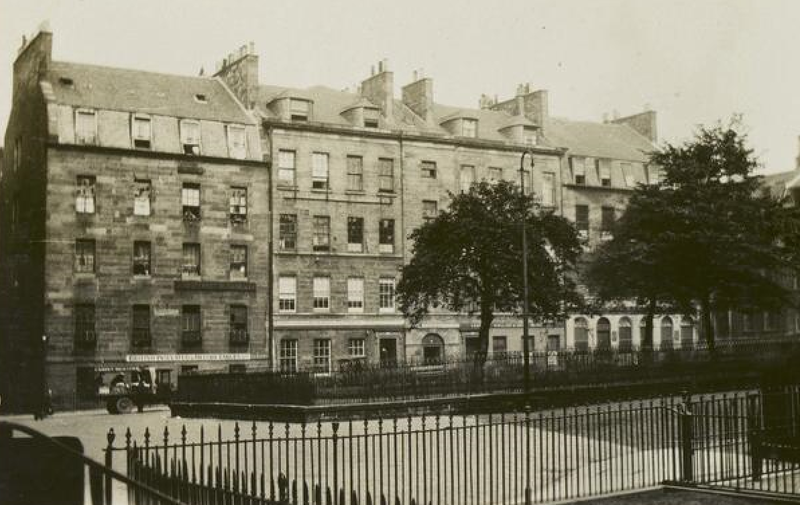 If anyone reading this has any photos of this tenement please be in touch. By 1900 the top o’ the Walk was looking somewhat different from today. There were twenty two pubs in the triangle between Leith Street and York Place, while the supper-rooms [today’s fish and chip shops] were pale by comparison with the up to date ice cream shops of the day. [When Emilio Quilietti died in 1898 he had 8 ice cream shops]. There were dairies too with polished zinc counters and Littlejohn’s tea room who were famous for its shortbread. 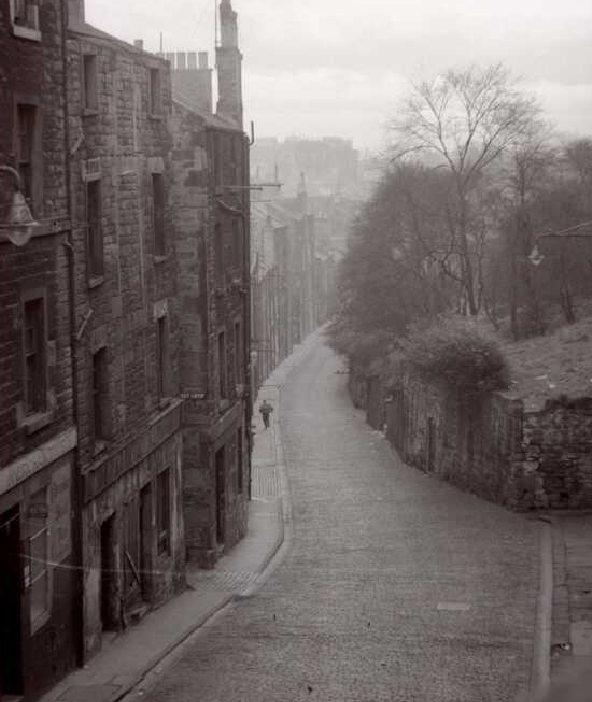 On the steps down to the Low Calton the new Black Bull, which had succeeded the old coaching Inn across the road. Above the door was a Bull’s head with eyes which lit up at night. Two tobacconists shops advertised their wares with life sized wooden figures at the door. One was a Highland soldier taking snuff. Today he is housed in the Huntly House Museum dressed in a dark green tartan kilt and red jacket. The other figue is of a sergeant in the Black Watch and it came from Henry Thomson’s shop. FURTHER DOWN THE HILL, MRS. QUILIETTI’S FIVE STEP SALOON WAS MANAGED BY SANTOS BRATTISANI, WHO COOKED FISH AND CHIPS WHICH WERE REMEMBERED WITH NOSTALGIA BY MEN IN FRANCE AND GALLIPOLI DURING THE GREAT WAR. In the future someone else may write about the many changes of recent times and the changing face of Greenside which is today unrecognisable. We wonder what Emilio and Valentina Quilietti would have though about the two giraffes who stand where they used to live. No. 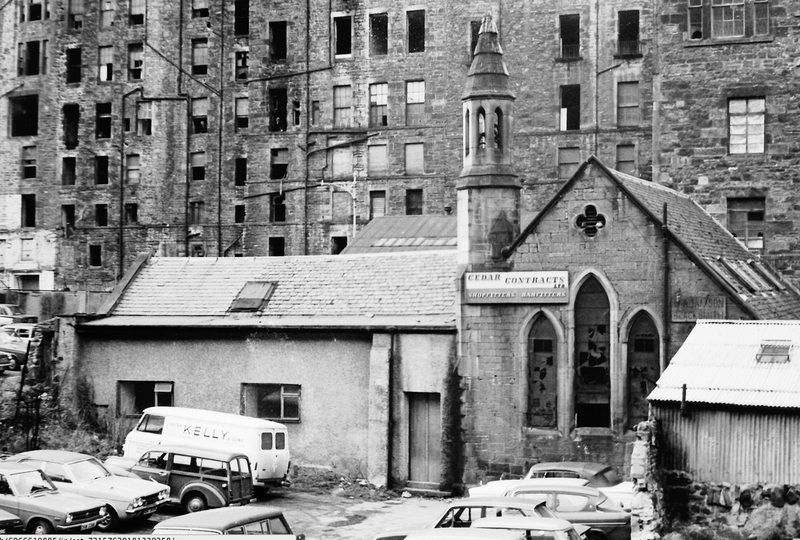 24 Greenside Place still stands in the form of C.C. Blooms, the gay nightclub. So remember if you ever frequent No. 24 and you see a ghostly shape, it may be your great grandfather Emilio Quilietti quietly watching over you. All the above facts were remembered by Barbara Guthrie who was born in the year 1922 in Greenside, the year before my own dad Joseph Quilietti was born there. Joe was born in Greenside. If we go on some sixty years we find ourselves at the top o’ the walk and familiar shops and cafe’s. The most famous of the chippie’s was of course the Deep Sea Restaurant. Nestled on the Island just in front of St. Mary’s on Union Place. Next door was the famous Bandparts. If you wanted any music it was there you would go. And the Central Cafe’ was one or two doors up from Bandparts. There were public toilets here as well. Moir’s Bar was situated where the John Lewis corner is today. This was reputed to be where the ladies of the night would ply their trade, especially when the fleet was in. Further up the hill was Burtons. It was a grand structure a testament to the 20’s. John Collier was another Taylor. Everyone would get their suits made to measure then. No off-the-peg then. There was an upper balcony where another set of shops and restaurants were nestled. 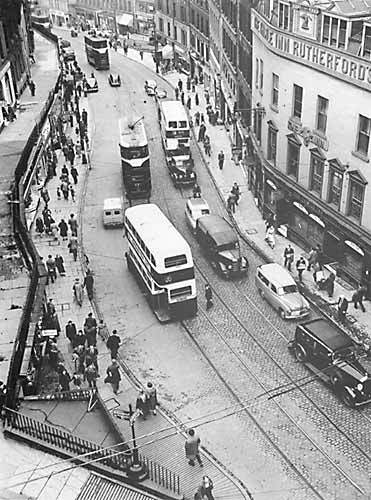 The Top-Deck Restaurant was a well known establishment which sold reasonably priced food to hungry Saturday afternoon shoppers. The Top Storey was also situated here. It was a club of the 60s where many local Bands would play. No drinking allowed of course. Shoe shops were also plentiful in the area with Stead and Simpsons and Easiphit situated on the same side of the street as Burtons. Opposite was the famous Edinburgh photographers where everyone went to have their photos taken. 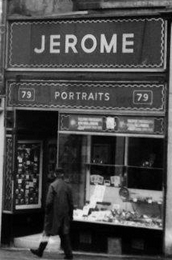 It was of course Jerome’s. If only we had all their negatives, what a website that would make. 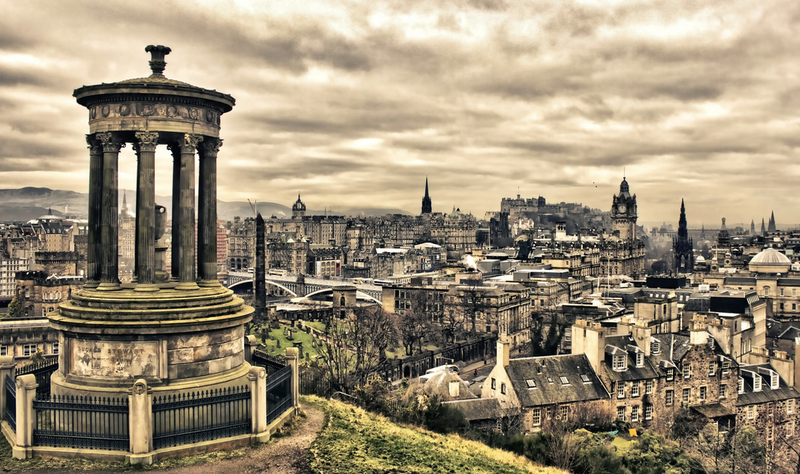 Just think of the history of Edinburgh in the faces of her children throughout the decades. I wonder what happened to their archives! Right next door was the infamous Fairley’s ballroom. It was a haunt of the sailors who were out on the town. But many marriages were also made here including my own aunt and uncle. Carel was a merchant seaman. On a night out in town he caught the eye of our Betty. They have been happily married for 65 years now and living in Holland. Fairleys in all her glory. Another Tailor called Jackson’s was just across the street from the pub situated underneath Fairleys. You could in the 60s have a made to measure suit for around £11 I am told!!! Above Jackson’s was a snooker hall called McLaughlans where the locals would spend many a Saturday evening enjoying their game. There was another night spot called The Imperial which had an even worse reputation than Fairleys. The Playhouse which had been completely restructured in 1929 stood at 18-22 Greenside Place, just next door to where my own grandad was born and my great grandparents lived, which was No. 24 Greenside Place. Today this address is called CC Blooms and it is a gay nightclub. Everytime I pass this spot I have a silent thought for my ancestors. But the Playhouse now re-built could seat over 3000 people. When it was built it was the largest and most opulent cinema ever to be built in Scotland and the 4th largest in Britain. It was the first super cinema. In 1929 Variety was very much a part of the cinema experience. Opening on the ‘Glorious Twelfth’ of August, 1929, the Playhouse originally seated 3,040. These were made up of 1,500 seats in the Stalls (coloured crimson, costing 1/3), 680 in the circle (coloured purple, costing 2/4), and 860 in the balcony (coloured old gold, costing 1/- in the front, 9d in the back).There were tea rooms on two floors, plus a tea, coffee and soda fountain lounge .The building is said to be haunted by a ghost called Albert, a man in a grey coat who appears on level six accompanied by a sudden chill in the air. He is variously said to have been either a stagehand who was killed in an accident or a night-watchman who committed suicide. 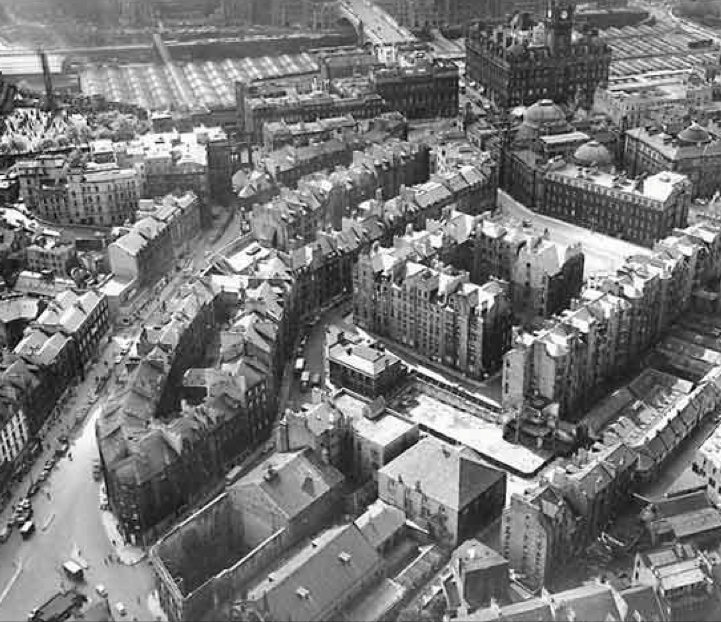 Picardy Place has it’s own place also in the history of our city. Arthur Conan Doyle, the creator of Sherlock Holmes was born here. His descendants on both sides of his family were from Ireland and he was born in Edinburgh on May 22nd 1859. So far as the record extends, Arthur’s grandfather John Doyle was a tailor’s son who started professional life as an equestrian artist in Georgian Dublin. He won commissions from aristocratic patrons, including Lord Talbot, Lord Lieutenant during a politically turbulent period from 1817 to 1821, and the Second Marquess of Sligo. 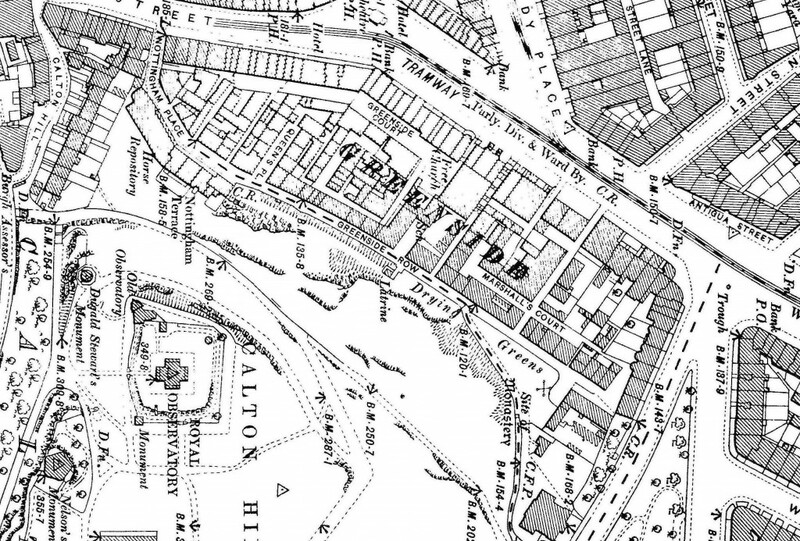 My granny lived in Queens Place and my mother worked at Leitch’s lemonade factory. I would dearly love to find an old photograph of that factory. Does anybody know where I might find one? The factory seems to have disappeared without trace in the late 1960’s. Hi Dientje I married johnny and we live in fife. I remember you and Jeanette, how is she? I stayed in Greenside Row till I was 5 years old I remember my mother talking about the robertsons.? My dad was a bus driver & when he was in hospital getting a operation the Robertsons went round the houses collecting food for my mother as i remember her crying at the door when she was handed the box full of food ! we were poor but the neighbours always looked after one another? My gran, also Mary, was born in 1923 to Eva & Charles Mcghee so she must have been your aunt. I would be greatful for any info on the family as Mary died shortly after my mum was born and we dont know the mcghee side at all. Hello Loved reading all you have here and wondered if there is anyone knows of my Grandparents who had a couple of shops in Greenside at one time, I believe from around the late 30’s up until my Granddads death in 1955 it was then run by their daughter Daisy until the place was shut sometime in the early 1960’s I think . 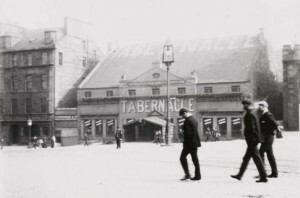 My Granddads name was JACK WALLER and my grandmother was Margaret Mary Waller they originally had a wine & fruit shop and next door a General Grocers shop but by the late 1940′ they only had the grocers shop left in Greenside , the wine part they moved to shop at Ballgreen at the other side of town . I’m not too sure of all their story but do have fond memories of going to the shop and running around with some of the local kids I remember Easter and her brother Peter I believe, who I think had a nickname of Tapper not sure all distant memories but remember many faces which I often wonder what happened to them all . I was only allowed to play when my granddad was not around so if he went out so did I out into Greenside to play with my new pals . 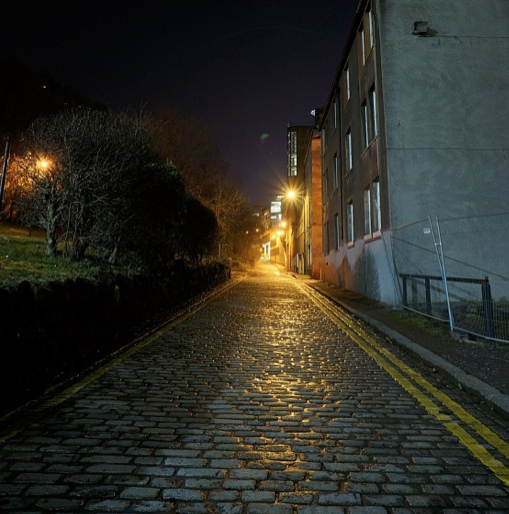 I also remember some sort of test of entry to the gang we had to sneak into the lemonade place at the bottom of Greenside, ( just round into the wee street and on the left hand side of the lane . I had to ‘pinch’ a bottle of juice, I remember being advised to ‘bring your coat’, as ,it was pointed out , had wide sleeves and would house maybe a few bottles in one go . Don’t remember how many I got but remember being terrified and sick with worry if i were to be caught, then doubly worried (scared stiff ) incase my Granddad were to hear of what I had done . I remember a lovely lady named Mrs Foley who had a son called Jimmy she live high above the shop on the opposite side of the street along a terraced bit then up the stairs beside the Sherry bottling place I think it was named ‘Sandimans’ but again not sure . My wee sister remembers more about visiting Greenside than me and can still sing a song about being a Greensider and I think she refers to “Grenside Keelies” with much affection, I must add . My grandparents had another daughter named Jean and a son also named Jack like his dad . I am the illegitimate daughter of the daughter named Daisy but never knew her when really young, I grew up referring to her as ‘Aunty Daisy’ as did my young sister all our lives ! My grandmother and Aunty Jean brought us up down in East Lothian going there as a toddler , from the mid to late 40’s moving from 8a Gayfield Square where I was born and where my grandparents lived. I read in other mail of the family ‘Soso’s’ being mentioned I have fond memories of them too and the Father who I can remember buying the ‘Evening News ” from up at the front of Register House . I can recall handing over a few big old copper pennies and this tall black white haired man with a big smile handing me my grandmothers paper, I give him a thought every time I pass the place all these years later . I remember a wee sweaty shop near the top of Greenside and a few years ago I may have remembered the owners name but I have to be prompted now adays . 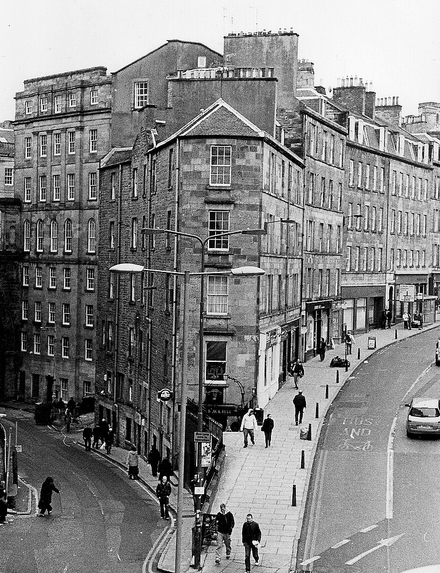 I do know Greenside was a run down area but my memories are all happy one and still remember the excitement of being told we would be going into Edinburgh ( meaning Greenside ) at the weekend . Happy Days thanks for the memory . Loved reading your story . I just received my grandfathers marriage certificate. He got married in 1860 at St. Cuberts. It shows he lived at No. 8 Queens Place in Greenside. He was a tailor. I just recieved the marriage certificate of my grandfather James Wilson who lived at No. 8 Queens Place in Greenside in 1860. He was a tailor. My Granny Main my Mums Mother lived at 9 Queens Place from around 1914 till her death ,my Grandad was killed in 1917 WW1 along the balcony on the first flat were the Mackies, not sure of the spelling, in the next stair were the Loves no relation to me there was Billy and George opposite them were Rab and Hendry Fraser on the top flat, Willie Wood lived at the entrance to Simpsons Court Rab Hendry and Willie Wood were In my class at London St. School, My future Wife Betty McKail lived in Marshalls Court she is no longer here, I remember Jimmy Blackie lived at back of Lady Glenorchys in a sort of square Billy McGovern lived down in that area to, also the McCallums I would stay with my Granny at the weekends, on a Sunday the older Guys would play Pitch and Toss and young kids would watch for the Polis. 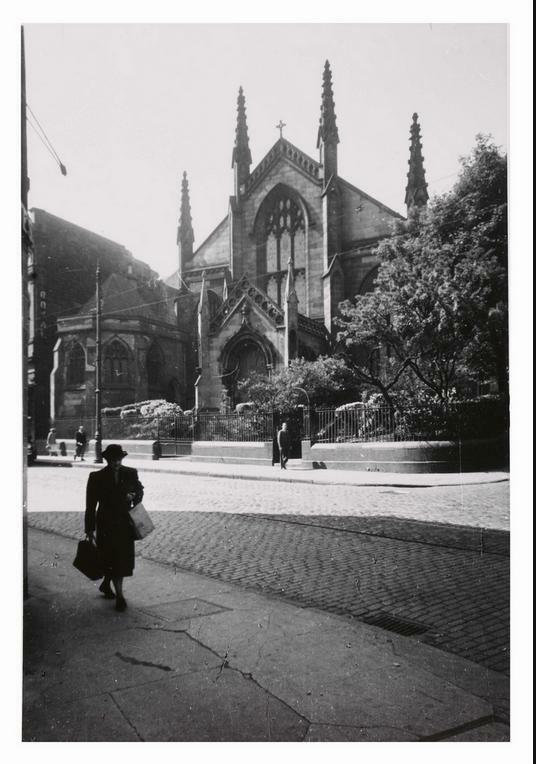 My Sister and I attended Sunday School at Greenside Parish Church and when we came out we would go up the Calton Hill and shout down to my Granny. 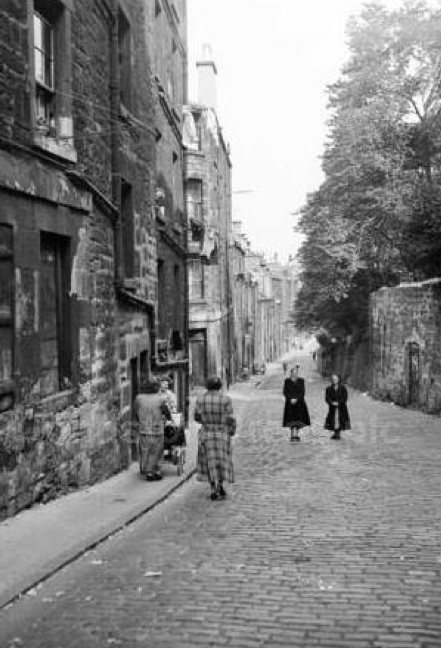 M y Granny used to go to the Jug Bar of the Argyle Bar and I remember a big white Dog would sit at the top of Greenside Row. Another name that comes to mind is Carl Soso again am not sure of the spelling MEMORIES all good.and I just remember there was to me at the time an elderly Gentleman live beneath my Granny Tim Dolan was his name and he once gave my Granny his collection of Ship Halfpennys to give to me. Sorry Helen we were too poor and too young to afford such luxuries as a Camera in fact I remember getting half a roll with what my Granny called Best Butter. Really enjoyed reading this. Thank you. I’m currently researching my family tree. 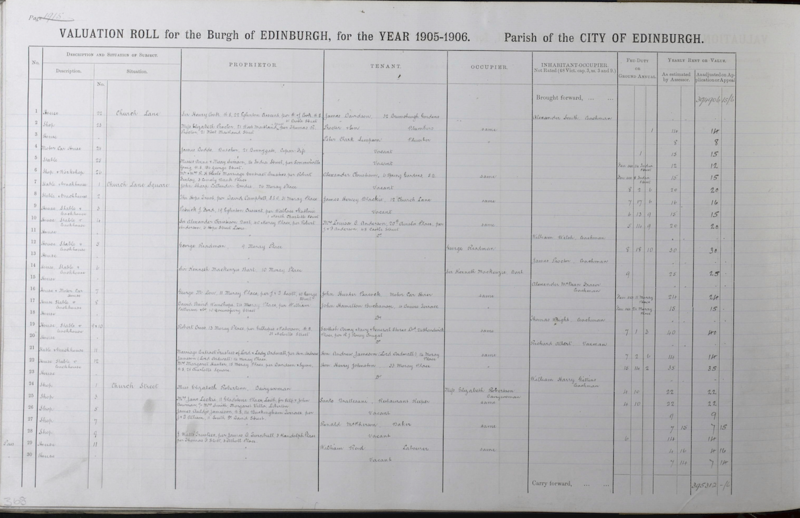 On a 1891 census there is an address of 2 Greenside Court. The photos are super too!! The photo labelled “Leith Street”, just before the Jerome photo, is in fact “Leith Walk” generally; and “Elm Row” specifically, between Montgomery Street and London Road. I lived at number 20 Greenside Row (Margaret Smith) and went to London Street and Bellevue School. Arrived Greenside about 1949 and left 1962. The Robertson lived above us and the Bogies above the Robertsons. Old Mrs Hall lived in the same stair as us. Our window looked out on to the washing lines and Cuddy lane was at the side of the wash lines. I was told that the milkman’s horse lived down in Cuddy lane. The McGees live further down the Row and I think it was their sister and her husband that owned the shop on the corner of Queens Place further up the Row. I remember at the top of the Row there was a shop that you had to go down some stairs to get. Then further down the Row opposite some Terrace (can’t remember the name) there were 2 or 3 shops a butcher and can’t remember the others. Then the McGees corner shop and opposite them was a second hand furniture shop. Then half way down but before the big square we all played rounders in was another shop. I don’t know why but I think there might have been a shop up a stair first floor. Then there was a shop right next door to 20 Greenside Row and that was where I spent any monies I had on ‘penny’ drink of lemonade. I also remember the seniors hall at the very bottom of the Row because when they had concerts if there was room they let us in for nothing. I know Greenside was classed as a slum but women took pride in cleaning their door step and keeping the kids clean. I had a great childhood there playing kick the can, truth dare promise or repeat, peever beds using my dads black tin of polish to push with my foot into each box.And of course rounders using the thick end of an orange box and 1 small ball. We spent most of our 6 weeks holiday from school morning to night playing rounders. Great fun. Sometimes a group of us would walk to Abbeyhill swings (the locals hated us because we took over the swing park). 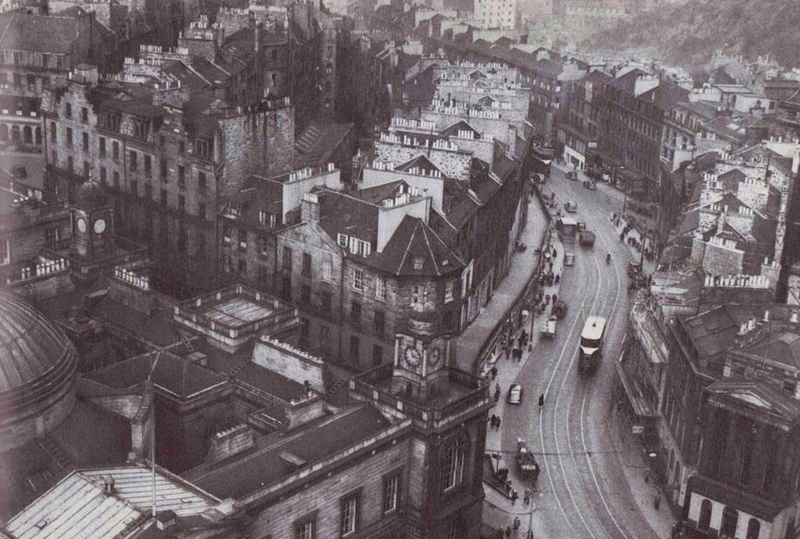 I also remember the policeman used to take us across Leith Street because it was so busy!!! Now living in New Zealand but often come back and yes I walk down Greenside trying to place everything. You remember so very much, even the names and addresses. 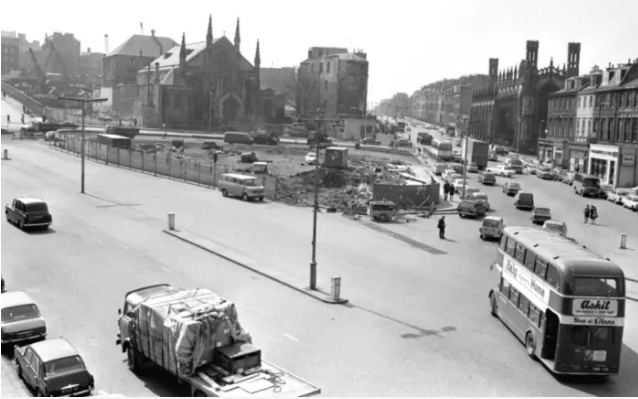 Thanks for sharing this very interesting wee bit of the Greenside History. We lived on the ground floor of 20 Greenside and yes I remember the Robertsons. My mum Mrs Smith used to borrow 2/6d from your mum on Tuesday (family benefit day( and pay it back to her on Friday when dad got paid. Do you remember Mrs Hall who used to live next door to you she only came there at the week ends and her gran daughter Pat. I remember having a street party for the Coronation. Great reading all the comments and brings back lots of lovely memories. Margaret Smith was my maiden name. I live in New Zealand. 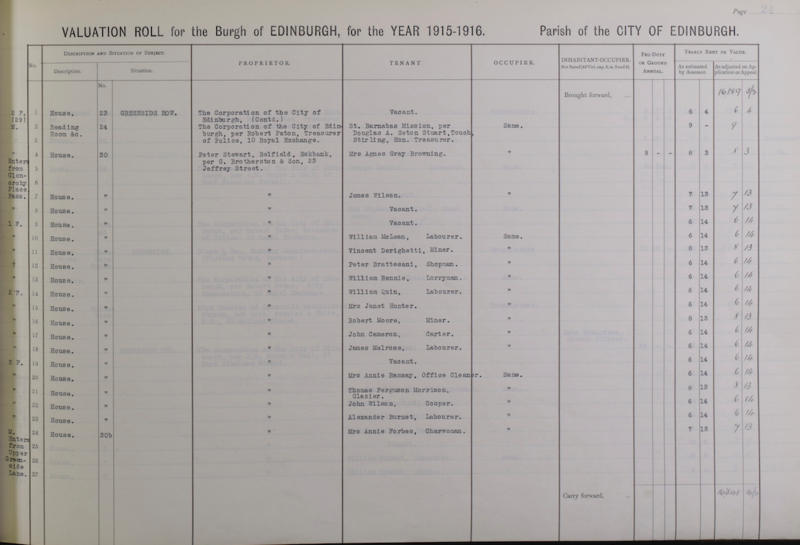 Al Love – my great uncle was born in 9 Queens Place in 1879! Just came across this page, and had to spend time looking at those incredible photos. Read the comments and came across the family name mentioned by Al Love. Spelling was spot on btw. I was born in No. 2 Queens Place, on the 8th of August 1953.and am so glad to have found this site, those photos, and my own family name. I am now just weeks short of my 65th, and reside in Almere, The Netherlands. I am on holiday at my sisters and we were remembering our childhood in Greenside. My granny Mrs Watt lived in Simpsons court and her house was used a hideout when the police came on Sunday while my dad and his brothers (Jimmy, John and Henry) played football. We lived in 30 Greenside Row our great grandfather Mr Gray lived above us. The dDerigettis lived on our landing. We used to play with the mccallums, Anna blackie and Eileen Clarke does anyone remember my family. My Great grandfather, James Smith, lived at 9 Queens Place from at least 1915 until at last 1920. Looking for information about Catherine Allison or Smith who was living at 9 Greenside Place in 1940.